Elwood Baker, resident of 230RD, South Taylor, British Columbia passed away on February 18, 2018 in Fort St. John, British Columbia at the age of 77. Elwood was born in Peterborough, Ontario on January 24, 1941 to parents Bruce and Aileen Baker. Elwood married Betty Johnston on August 20, 1960 in Callander, Ontario. 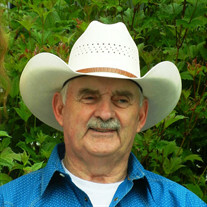 Elwood moved to Telkwa, BC in 1961 and then later to the Peace Country, he worked as a logger and farmer all of his life. Elwood is predeceased by his parents Bruce & Aileen Baker, infant daughters Tina Rose & Baby Elizabeth, as well as his brother-in-law John. He is survived by his wife of 57 years, Betty; children Susan (Trevor), Doug (Don), Sandy (Peter) and John (Mila); grandchildren Melissa (Jeremy), Tiffany, Miranda (Buck), Holly (Chris), Layton, Courtney (Matt), Alexi, Ella and Kameron; great grandson Emmett; step great grandson Landon; siblings Ken (Karen), Shirley, Bonnie (Abe), Bob and many other relatives, in-laws and close friends. Special thanks and appreciation go to Dr. Wright and the nurses at the Fort St. John Palliative Care, especially Sarah White, Charlene McCormick, Stephanie and Sarah Kurjata. In lieu of flowers expression of sympathy can be made in memory of Elwood to the Fort St. John Hospital Foundation Cancer Treatment Fund or the BC Cancer Foundation.